Process oats, sesame seed and 1/2 cup walnuts a small amount at a time in blender container until of flour consistency. Mix in salt and 3 Tbsp. cold water. Press into 9-inch pie plate. Bake at 350 degrees for 10 to 15 minutes or until golden brown. Dip banana slices in lemon juice. Arrange in pie shell. Top with strawberries. Blend cornstarch and pineapple in saucepan. Cook until thick and bubbly, stirring constantly. Cook for 1 minute longer. Stir in vanilla; cool. Spoon over fruit. Chill for several hours. Sprinkle with 1/3 cup chopped walnuts. 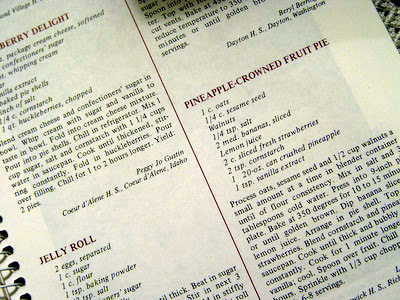 One of my recipes --- published years back in the Great American Heritage Cookbook --- which contained favorite recipes of home economics teachers. Walking down memory lane on this chilly winter day. It sounds perfectly delicious! You were a home ec teacher? Now that sounds like fun. Sounds delightful - will print it out too! This recipe is so different for a pie, but sounds good.